Hi, I like to ask people's views how they maintain there ebike at home..do you service it at home? I use a watering can wash it, then use some friendly bike wash (GUYS) then rinse it with a watering can then dry it off..
As for servicing, as my e-bike is brand new it gets a free first service. After that I can maintain it, unless it’s something I don’t have tools for, or competent skills. On my acoustic bike I’ve had the freewheel rebuilt several times by my bike shop as they know what they are doing. Likewise with bleeding brakes. First thing I do is remove the battery, then the wheels and clean the frame in a bike stand. Then Muc off protect and shine buffed with micro fibre. Same process for wheels but with a stiffer brush on the tires, and before using Protect and Shine I cover the rotors with plastic bags. its worth doing the spokes also so you can feel if any are loose or too tight. Then I take the jockey wheels out and clean them and the inner cages. Then I do the chain with GT85 and rag - same for the front chainring. Then I do the stanchions with Slick honey and compress everything a bit to get the seals coated in honey. This might seem OTT but where I ride it is solid clay and flint, which sets like concrete and is very abrasive. What would you do if you cannot remove the battery, IE on a Focus Jam with internal battery in the down-tube. Removing it is waaaay to much hassle. Every time I wash mine, I get a bit of water in the motor area, no matter how careful I am. Exactly the same as a normal bike. Just make sure it's turned off. I have always pressure washed mine I’m just careful around seals and bushings. Not to blow water into them. People think I’m crazy but i been pressure washing my dirt bikes and bicycles since 80’s and i have never had an issue because of it. Normal hose, avoid blasting electricy bits, scrub will long-handled dishwashing brush . My JAM sometimes turns itself off (I often leave it on to see what will happen), and can be a little stubborn to restart after a good wash, but we always get there with a little encouragement. I can honestly say my bike never been anywhere near that muddy, out trail system has a 48hr drying period there closed after it rains. So by time trail open there only puddles that for most part you can avoid most of them. Or i go slow through them as i don’t have fenders. That’s about as dirty as mine gets around here. It’s been raining 7 straight days. In the UK here. I have gone from late May to late November without feeling the need to wash the bike at all. I just wiped the chain and stanchions and then lubed them before each ride. Since late Nov, the bike has had to be washed and lubed after every ride. I must say however, that this was the first year that has ever happened for me. @ Norange: After that commute, what do you look like? 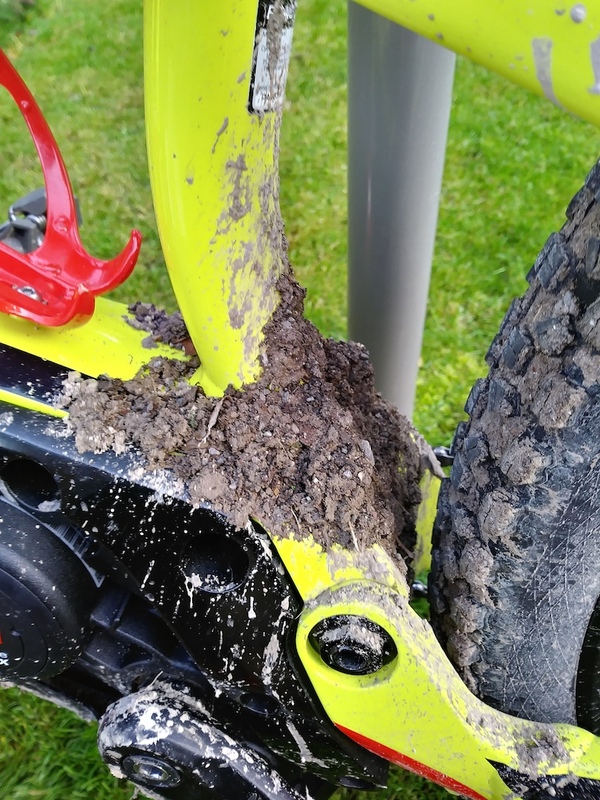 Since the battery in the 2019 Levo is in the frame do I have to remove it every time for cleaning? Nope. That'll then leave the connectors loose and exposed. Even more fun when it's below 32°. Hiya, just got a Sam2 and all my rides have been muddy, so been washing regularly. Last ride when i turned it upside down for the car, I got a bit of water coming out around the top tube switch. So last night thought I would do a check on the inside of the frame through the vent ports and take off the switch. Switch is well weatherproofed, looks IP66, which is nice. But looked through into the headtube and there was a pool on the bottom headset bearing!! I think some water is getting in around the switch when washing, this has now been sealed a bit better with light grease. Either that or the rubber seal around the steerer tube is not working well ( I had to drop the forks out to cut down when changing stem. Noticed that the rubber had been nicked a little during assembly and that top bearing was already getting a little rusty anyway, it was surface was v dry, have put a light smear of grease on for protection there). On my washes, I've tried to avoid spraying into the vents, but yes could have gone in there. One of the issues (on my SAM2) is the hole drilled into the headtube, where the down tube joins, is at the same level as the bottom of the down tube ( if that makes sense ) so water can easily make its way forward. Removing the plastic covers and looking in though the cable vent ports is the best way to ee into the headtube. I have noticed that everything on bike was assembled very dry, so that threads will start to rust and creak with winter conditions (dry/wet/dry cycle). This is pretty normal with direct from factory bikes, I recommend all bolts should be checked and lightly greased by owner. So do a little maintenance and lightly grease those bolts when you check them for tightness, maintenance basic that! That nice black plate on down tube (it gets changed for TEC pack) i think is attached by the battery bolts from the bottom (secure battery inside frame). But you get holes on the top with 45deg edges into a thread that can fill with grit and mud. I found that bolts with angled seats, usually used for mounting chainguides/bash guards fit perfectly, and will seal and keep out the crap. a little grease to help seal. REMEMBER TO REMOVE FORST IF TAKING OUT BATTERY OR CHANGING THE PLATE. There is one bolt hole left on the motor where there would be a third chain guide bolt, you can just get a bolt in there without touching the chainring. Keeps crap out again. The black plate has two holes drilled, for bottle mount! You will need extra short bolts tho so you don't contact frame. I'm gonna try with Wolf Tooth BRad system to get a bottle and tools mounted. The bottom motor bash guard is easy to remove, with star bolt driver, catches crud in there so take it off once in a while to clean. i would recommend a light dab of blue thread lock on those bolts when replacing. You can also check the run for the dropper cable there as well. Keep it unkinked! I'm gonna get some moto foam to bung in at the back of the motor/frame hole to help keep out the crap from back wheel. Took the switch and both covers off this evening and no water at all in the head tube, squeaky clean, so may be an issue following your cut down. I also took the opportunity to grease everything so hopefully a little less creaky next time out. We've had engines off and batteries out several times and all is very simple (except the clearance getting battery in & out). Like the foam idea, will have to have a good snoop around next time I'm down there. Glad to hear, still not sure wear it came from but gonna be careful with water around the headset. Might try and get a new headset seal from Acros. @ bissona: Can you provide a link to the "moto foam" you will be using please? To be honest I was just going to use any open cell foam I found around the house! That said, I like the look of the GS's bottom linky so may throw an order that way. Great, but how big is one piece? That image could be any size, and no details are provided on that screen.